This condo is the perfect combination of convenience and comfort, this cozy 1 bedroom, 1 bathroom condo is located in the heart of Keystone at Expedition Station. Expedition Station is the ideal location for family entertainment, located in the heart of River Run Village you are just steps away from restaurants, retail shops and vendors. This unit is sure to leave you satisfied with its perfect location and generous accommodations, providing comfort and excitement for the whole family! In the wintertime, enjoy an ice skating rink and outdoor fire pit located mere steps from the front door. In the summertime, you are perfectly positioned to join in the revelry offered in River Run Village. Whether taking in live music, sampling beer, or pigging out on Bacon, you will surely enjoy the proximity of this property to all that River Run offers summertime guests. If festivals are not your style, enjoy downhill mountain biking, golfing, hiking or horseback riding! The master bedroom has a full bed and the living room has a queen sleeper sofa next to the cozy gas fireplace. Guests enjoy the convenience of a fully equipped kitchen and access to the community pool and hot tub. Take in views of the pool as from the balcony off the living room.This complex offers a heated underground garage, each unit has a large patio or deck, most with excellent mountain views. 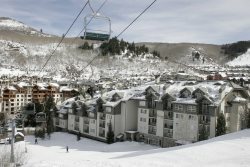 Enjoy easy access to the gondola, located just a few hundred yards away.